Christopher Bates, Canadian menswear designer of the moment (and then some) wrapped up this season’s Toronto Men’s Fashion Week (Friday, February 27th) with his Fall 2015 collection, Modular, inspired by Leonardo da Vinci’s Vitruvian Man. There was a definite air of excitement as masses of people overflowed this ‘must see’ show. His looks were sleek, defined and strong, made for the man with modern control. Geometry, architecture and anatomy were the central bolts of the show, which Bates worked into the clothing with his use of lamb suede, perforated denim, wools, and Italian leather. Needless to say, the man has amazing attention to detail and technical skill. On the back wall of the runway, it read that the line was ‘Designed and Produced in Italy’. 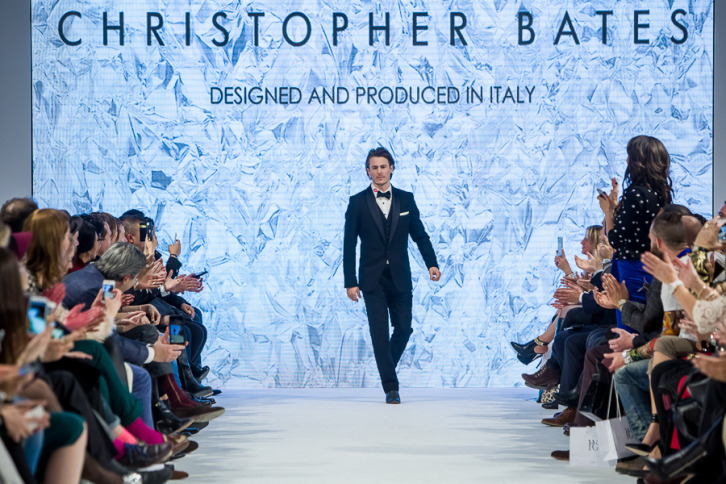 This referred to Bates’ recent move back to Milan (where he originally studied fashion at Istituto Marangoni), where he decidedly went with the intention of growing his brand on a more international level. That seems to have been a good choice as this collection was very tight and cohesive and ultimately, the best show of TOM. Also check out Christopher Bates at TOM* last season. Jo-Anna Davidson is a fashion stylist based in Toronto ON, Canada. She has worked with top photographers and noted people in the industry. Her portfolio includes work published in magazines both in Canada and worldwide. Her strength is her energy and responsive creative vision. This has led to executing distinct style and a recognizable ability to effortlessly fuze all elements which shape her stories.